I've heard that when you awake in the middle of the night (like 3:35am) and you're awake for more than a half hour (you're still staring out the window at 4:15), you should just get up and do something. Making cinnamon rolls is probably not advised, but I was awake and hungry. Don't ask why I was awake in the middle of the night. I've have issues sleeping through the night since I was a babe. You wake up, your mind starts going and you're done for. At some point around 4am, I started thinking about the cinnamon roll craving I've been harboring since Nebraska, where I ate the most delicious cinnamon rolls I've ever eaten in my life! Of course, they're from a store that's only open on Fridays and the last Friday I was there, they were closed and I have thought of those cinnamon rolls every Friday for months. There are no pictures because we kept eating them so fast. But back to my rolls. There I was awake with a craving and a rumbling tummy. My first Google search result landed me here on Sally's Baking Addiction. I subbed in a 1/2 cup of whole wheat flour (Ron Swanson: vegetables is like Siobhan: whole wheat flour. I have way too much of it in my pantry and it makes me itch, and I need to get rid of it before I don't know myself anymore. ); brown sugar (I keep forgetting to buy white sugar); and didn't manage to get that last 1/3-1/2 cup of flour into the dough. 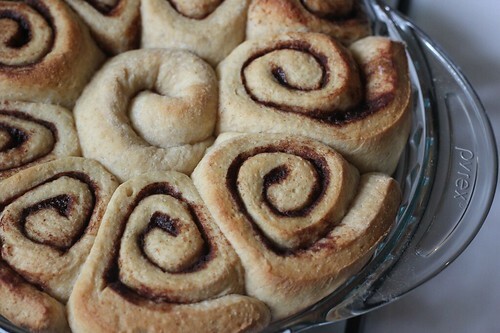 Around 5:30am, there were rolls rising in my oven and I was finally sleepy enough to fall back asleep. When I woke up a few hours later, it was the perfect time to turn on the oven for these bad boys. For the frosting, I used two tablespoons of maple syrup and one tablespoon of coffee, and it's still a bit sweet (yes, I added some salt.) 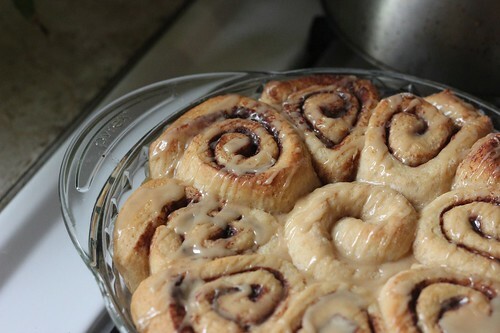 I don't ever fully frost cinnamon buns as I like to add a little more drizzle on the individual servings. I would use this recipe again, though I'm still experimenting on my desired maple frosting. 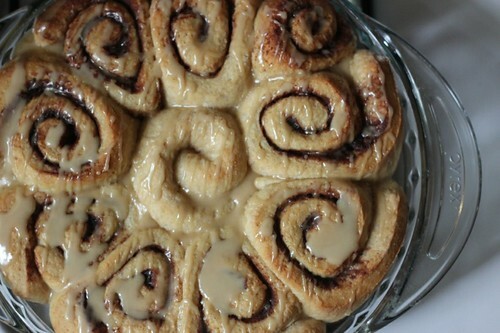 And I might be possibly looking up flights to Lincoln, Nebraska, because er mah gawd, those cinnamon rolls.